“Yeah,” sheepishly murmurs the patient. The truth is that people get eye infections all the time and sometimes the treatment of that eye condition will require that the patient be out of contact lenses. This will make sure that the infection heals quickly, and makes it easier to put in the eye drops since most prescribed medications must be applied to an eye without a contact lens in it. 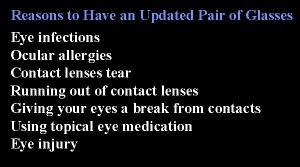 Besides eye infections, there are other scenarios in which having a good pair of back-up glasses is needed. If a person tears their last contact lens, they can wear their glasses in order to get them through the day. At Vista Eye Care, our optometrists are here to help you see better and keep your eyes healthy. Should you ever tear a contact lens, we would be more than happy to offer a replacement. If you lose or tear a contact lens before your annual exam is due, we can either get you in a bit early, or even give you a trial pair to bridge the gap –we are always happy to be there when our patients need us. However, having back-up glasses gives you the confidence to know that in the event that a lens tears, you run out of contact lenses, or you have an eye infection or injury that prevents contact lens wear, you will be able to go about your day with great vision. While back-up glasses don’t need to have all the bells and whistles that daily worn glasses do, we recommend that your contact lens back-up glasses be comfortable, updated, and functional. You don’t need designer frames for a good back up pair, but rather an updated, affordable pair of glasses. If you work in an office at a computer all day, you will likely need to have a good pair of computer glasses for back-up. If you drive a truck for a living, even a barebones pair of contact lens back-up glasses should have a good anti-reflective coating on it. Contact lens wearers should also consider having their sunglasses updated with their current glasses prescription. Patients with specialty fit contact lenses for keratoconus, high astigmatism, or post-LASIK contact lens wearers should realize that replace lenses often take 1-2 weeks to arrive, and back-up glasses are essential to successfully wearing these types of lenses. Patients that don’t have back-up glasses tend to wear their contact lenses more than they should. Even with an eye infection, those patients have no alternative to clear vision, and they sometimes continue to wear their contacts. This can result in a prolonged infection, or a worsening of an existing infection, perhaps resulting in a corneal ulcer. At Vista Eye Care, we pride ourselves in helping our patients maintain healthy eyes and clear, comfortable vision. Call our office today at (303) 450-2020 to schedule your yearly eye exam, contact lens exam, or pediatric eye exam. 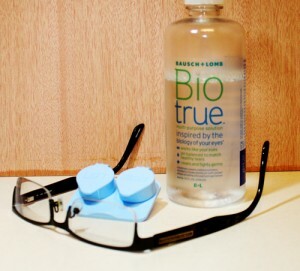 No appointment is necessary to be fitted for contact lens back-up glasses!